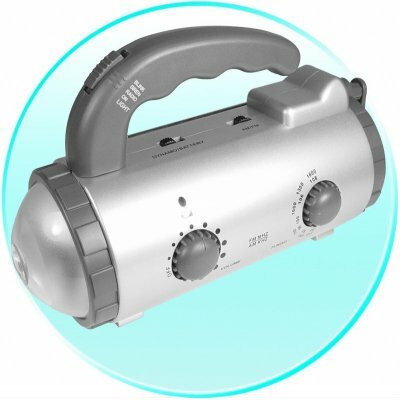 Successfully Added Emergency Dynamo Powered LCD Light + AM And FM Radio to your Shopping Cart. LCD Light and Alarm, plus AM or FM Radio powered directly via a the hand operated Dynamo Crank. This Wholesale gadget is perfect for Energy Conscious Consumers worried about wasted batteries or for emergency power-out situations where there is no more power available. Simply wind the Dynamo Crank for one minute, and you will get up to 8 minutes of Radio. The more you crank, the more power will be charged in the Built-in Ni-Cad Battery. Be ready for bad weather or good with this wholesale priced Dynamo Powered Gadget Direct from China..
Dynamo Crank: Powers the Built in Rechargeable Battery. Longer you turn the dynamo crank, the longer the power will last for the functions.